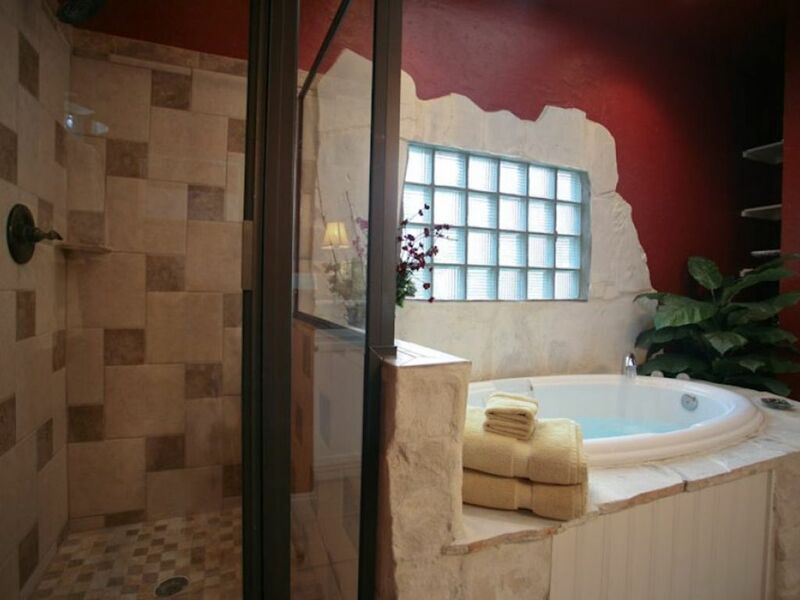 Amore Dolce B&B in Fredericksburg, Texas is a romantic and beautiful getaway in hill country. Amore Dolce, the original carriage house of the new Blooming wild retreat Amore Dolce means "sweet love" in Italian and is certainly an appropriate name for this charming, romantic cottage in the famed historic district. The crowning jewel of this private cottage is the Jacuzzi tub for two set in limestone, Italian style, with a skylight above. Downstairs in addition to the decadent bath, you will find a California king size bed with 32" wall-mounted TV with cable selections. You will also enjoy a large kitchenette plus a cozy nook which holds a twin size bed in case you bring an additional guest. Upstairs in the loft, you will find a comfortable sitting area with a writing desk, plus a love seat and a second 32" flat screen TV with cable. Make Amore Dolce your own little slice of Tuscan heaven here in the Texas Hill Country! Large Yard No Daily Housekeeping Breakfast Gift Certificate to Local Eateries Shampoo Lots of Charm! The cottage was great - location was close to Main Street and it was very quiet. The bathroom is definitely the highlight of the cottage - the garden tub was awesome for relaxing. My only complaint was the bed. The mattress was very uncomfortable. Both nights my daughter and I tossed & turned - we both woke up with lower back and hip pain. Other than the mattress needing to be replaced, everything was great. Thank you for sharing about your experience at Amore Dole. We are glad that you enjoyed the cottage and its proximity to Main Street. Thank you also for your concerns about the comfort of the bed. We will certainly take this into account in our improvements early this year. We hope you will consider returning to Amore Dolce should you visit Fredericksburg again. My only complaint about this place was that because it was indeed so close to the main area of town that we were not at the cottage as much as we would have liked - because it is great. This place was so clean and was within great walking distance of the main street area. It was so great in our downtime to be able to sit out on one of the two patios that are at this cottage and to just enjoy our time relaxing. This place provided such a great space inside as well - it was so very comfy and made for a great place to come home to after a long day of shopping. If you're looking for a cottage that's comfortable and close to everywhere you'd like to go in Fredericksburg, I would highly recommend this location! We had a wonderful time staying in this adorable, cozy cottage, right in the heart of Fredericksburg. My teenage daughter and I enjoyed a relaxing mother-daughter break here. The cottage was immaculate upon our arrival. The only thing I would mention is it would be nice to have some extra cookware (baking trays etc) for when using the oven, but I guess generally people eat out when staying here. We just love to cook! Check in/out was very easy too. Definitely recommend staying here and we will be back soon!! This property was perfectly located for both touring Fredericksburg shops, galleries and restaurants, as well as Hwy 290 wineries. The cottage had everything we needed and was very roomy. The bed was comfortable and the bathroom was great, large jacuzzi tub and walk in shower. We also enjoyed the sitting area upstairs. I have already shared the site with friends and family. Absolute Charm, was a charm to work with as well, very easy and so close for key pick up and gave us very useful information to use to tour the town. Shelly, thank you for choosing to stay with us at Amore Dolce in Fredericksburg! We are so happy to hear that you enjoyed your stay. It was a pleasure having you and we hope to see you again very soon! We loved our stay. It was great even with the horrible rain and flooding we got to have a great relaxing evening sitting upstairs listening to the rain. The tub is AMAZING!!!! We will definitely be back. Be sure to go to the Fredericksburg wineries the one on Main Street has a Christmas wine that is awesome! Served hot like a cider! Thank you for choosing to stay with Absolute Charm in Fredericksburg! It was a pleasure having you and we hope to see you again very soon. So happy you had an amazing time in Fredericksburg! The property was nice. My daughter and I really liked the bathroom size since we were in there getting ready together! We also liked the location, being so close to the shopping and restaurants. We never could get wifi to work. We realized on our 2nd day that the modem upstairs wasn't on so we turned it on and it still didn't work. That was the only problem. The hair dryer was broken, but a new one was delivered shortly after I called about it. Thank you! Rates: $129 - $199 Rates are subject to change. We offer special pricing Sunday night through Thursday night during most seasons for your Texas getaway. Some special event periods and holidays are excluded but we do offer the special rate during the vast majority of the year. For all other specials, promotions, as well as upcoming events, check out our Facebook page. Holiday Pricing: Weekday Special Pricing is not available during the following, but not limited to: Martin Luther King Day Presidents Day Valentines Day Easter Holiday Spring Break Memorial Day 4th of July Labor Day Oktoberfest Weekend Thanksgiving Holiday Christmas through New Years season **While a two night a minimum is generally required at all times, a three night minimum is required on some holidays. Please call if you have any questions. Weekday Special Pricing: Please note that a two-night stay is required in order to receive the discounted rate. We do not allow moving from room to room for purposes of determining the length of your stay. For example, if you stay one night in one room and then move to another room that does not qualify as a two-night stay for purposes of receiving a weekday discount. As you can imagine, housekeeping costs skyrocket when rooms have to be completely cleaned from scratch daily. If you would like to move rooms during the week, you may do so but will NOT receive the weekday special price. If you choose to move rooms during a weekday stay due to your preference, you may only do so with a $35.00 per move fee to cover additional housekeeping costs. Consider planning your trip to coincide with these days so that you can enjoy the amazing savings and have a little more elbow room while shopping in town as well! Make the most of your Texas Hill Country vacation!